I'm not sure were the line is, if there is one, that makes progressive metal either ingenious or merely derivative, but Venezuelan band Echoes is definitely in the former camp. Nature/Existence, their debut work on ProgRock Records, borders on near flawless genius, a disc of pure progressive metal brilliance. Formed in 2004, in country where ethnic rhythms and pop/rock are more prevalent, Echoes was an eccentricity and sometime phenomena, being the first instrumental band to win at the national "Alma Mater" Rock Festival. Drawing upon the important roots of 70's to 90's prog with rock and metal, Echoes was determined to mix ethnic traditions into their music. By example, the band incorporates the "cuatro," a traditional Venezuelan folk instrument similar to an ukulele, into their already deep ensemble of three guitars, six-string bass, keyboards, and drums. Additionally, for Nature/Existence Echoes recruited several (exceptional) guest vocalists, the gifted saxophonist Dave Duffus (Winds of Dread, Despair), and a chamber string quartet (Farewell). The result is that Nature/Existence builds upon and spans everything from Pink Floyd to Dream Theater to even 3 or Muse, only to sound immensely original and entertaining. Working on a theme of love found and lost over the cyclical nature of life, Nature/Existence spins common interpretation making the Epilogue the beginning of a new experience and breakups are the Prologue to life shifting again. Confused? Don't be. Within and in between, Echoes weaves an inviting and ingenious score which juxtaposes immense and diverse musical movements with emotions of passion, love, melancholy, and sorrow. Echoes can do this in grand form in more lengthy pieces like Leaf Motif or Unfair. Yet the music packed into the brilliant smaller pieces such as Bonfires, Farewell, or the absolutely magnificent (and Floydish) Winds of Dread are pure prog magic. 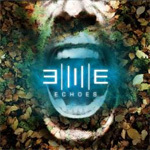 Honestly, I can't say enough about Echoes's Nature/Existence as there were times, when listening, I found words failing me in description. Nature/Existence is a true progressive metal delight, a work of singular accomplishment by which others, past and current peers, could easily be judged. I know it's too early in the year, but Nature/Existence is on my (very) short list of best prog albums of the year. It is that good! Highly recommended! Nature/Existence is a true progressive metal delight, a work of singular accomplishment by which others, past and current peers, could easily be judged. I know it's too early in the year, but Nature/Existence is on my (very) short list of best prog albums of the year. It is that good!